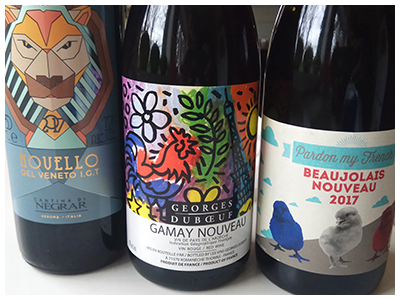 I realize that Nouveau wines are no longer news, and out-of-fashion in some circles. However, I’m still a fan and will be guzzling the stuff for the next few days – and nights. Nouveau is about celebrating the harvest – with wine from the harvest, what’s not to like about that. So forget fashion and do a little celebrating. For what it’s worth the 2017 Nouveau are the best I’ve had in years. Below are my three picks from this year’s LCBO offering. All will be better with a light chilling, baguettes, platters of charcuterie – and anyone you care to party with. P.S. I always buy a few Nouveau to have over the Holidays. Their lightness and freshness are a relief from all the richness of the season. And I’ve yet to find a better wine partner for the big bird.
. . . Juicy, fruity, lively, and delighted. Certainly an invitation to party. Gamayish. I’ll be drinking lots of this.
. . . Wonderful Gamay flavours and pucker. Best with food. Of the Beaujolais Nouveaus, Pardon My French was the winner at this house.